If you’re a durian lover like myself, you’re probably rejoicing over the arrival of the yearly durian season. Trips to the nearby market usually means coming home with a box (or 5) of freshly opened durians, and listening to your mum haggle over prices with the store owner in dialect. But one of these grocery trips led me to a rather interesting store – one with a banner that caught my eye immediately. With a caricature of a Caucasian man holding up 2 durians, the store’s name wasn’t of the typical ‘(insert Chinese name or random numbers) Durian’ variety. It was ‘Durian Ang Moh’, with the words ‘卢克榴莲’ (Luke’s Durian) below the drawing. Unfortunately, the ang moh in the photo wasn’t at the store at that point of time, and I wondered about the Caucasian behind the business and his passion for the fruit. 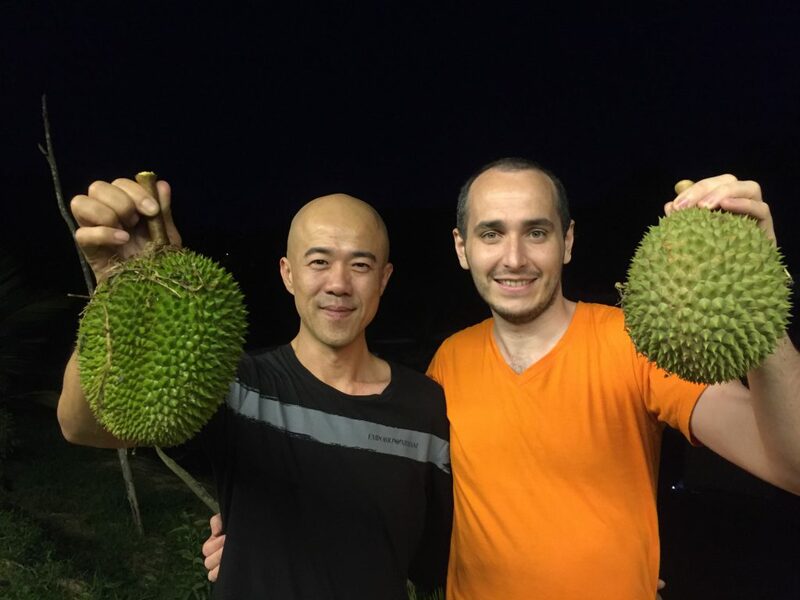 Fortunately, I managed to contact Luke, and found out more about the story of the ang moh who loved durian so much, he started a business selling it. A polarising fruit, unlike apples or oranges, durians are either worshipped or despised – many from the former group likening its smell to rotting socks, garbage, and all things stinky. This was what Luke Otter (30) thought so too, when he had the first taste of its custardy flesh in the form of durian cake back in 2007. 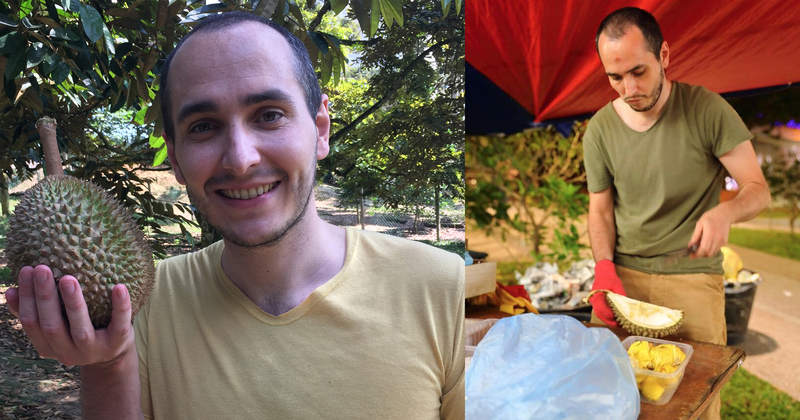 Originally from England, Luke came to Singapore as a volunteer at Sungei Buloh Wetland Reserve, where he volunteered for 3 months before returning home to complete his university education. After he completed his studies, the then 21-year-old moved to Singapore permanently, and has been living here ever since. It was also as a new resident of Singapore that he decided to take on the real fruit a couple of years later. Even though he admittedly “took a while to appreciate it”, he found himself slowly getting hooked onto its creamy flesh. An interesting tidbit about this adventurous foodie – he is also a fan of ‘acquired taste’ foods like petai bean and stinky tofu! 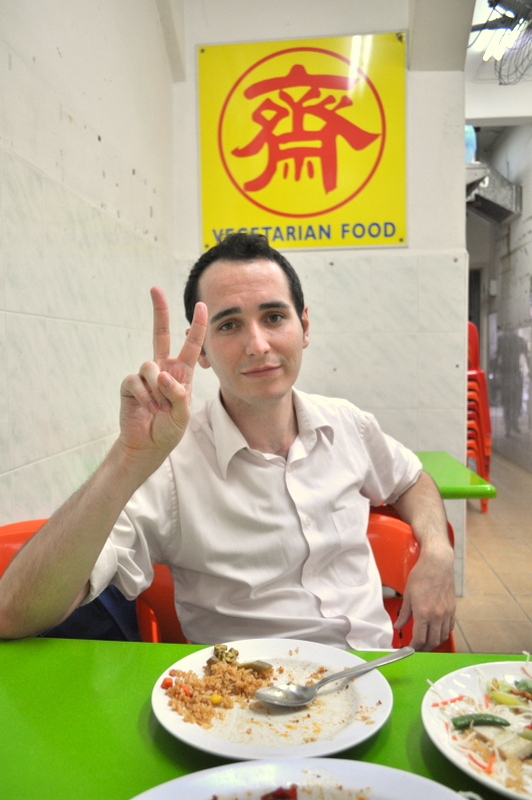 Previously a motivational trainer for Adam Khoo for several years, he created a blog, Hungry Ang Mo, in 2009 as both a hobby and a means to document all the vegetarian and vegan food places in Singapore. His pet project soon became very popular, and he even has a special section dedicated to reviewing durian sellers. 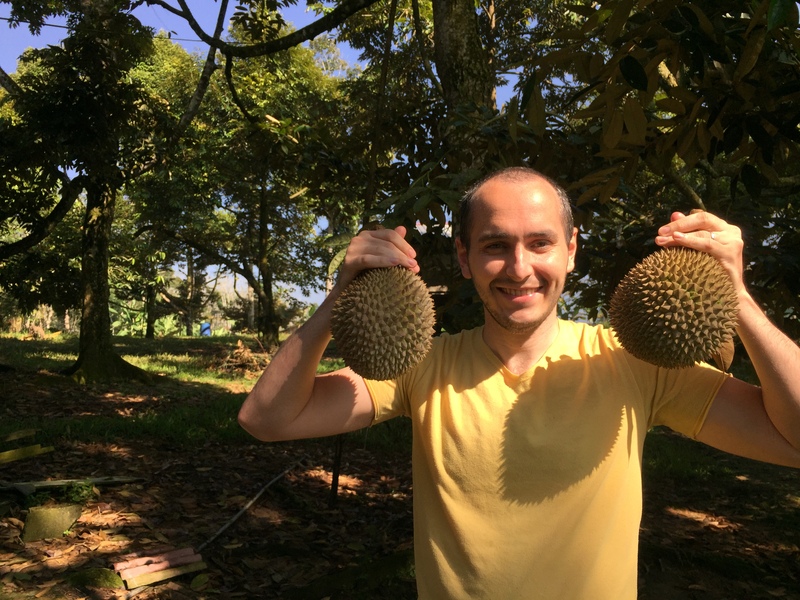 Reading through his durian-related posts, his passion for the fruit is evident, as he describes each variety in great detail, putting our meagre knowledge (think about it: how many types of durian can you name?) to shame. At the moment, he has put the blog on the backburner, given that he had reviewed most of the vegetarian places in Singapore already. But while many of us love to eat durian as much as the next Singaporean, setting up a durian business is on a whole new level. To Luke, however, it “seemed like a natural progression”. Previously a Sengkang-ite, Luke would cycle, several times a week, to Hougang to buy durians – the closest location that has durian sellers. However, the durian lover kept getting cheated by dishonest sellers who were hoping to earn an extra dollar from him. It was also through this storm that he found his lighthouse – Ah Teck, an experienced durian seller with over 25 years of experience. Soon, they built a friendship, as Ah Teck taught him the ins and outs of selecting the best durians. Eight years later, the unlikely friends met up again, as Ah Teck brought Luke on a ‘Durian Holiday’ – which entailed durian farm visits and “durians for breakfast, lunch, dinner and supper and in between”. It was also during the holiday that the duo decided to embark on the ‘Durian Ang Moh‘ project. Luke never had a formal education in Mandarin or any Chinese dialect, but over the years in Singapore, he had managed to pick up a decent amount of Mandarin, and communicates with his partner using it. 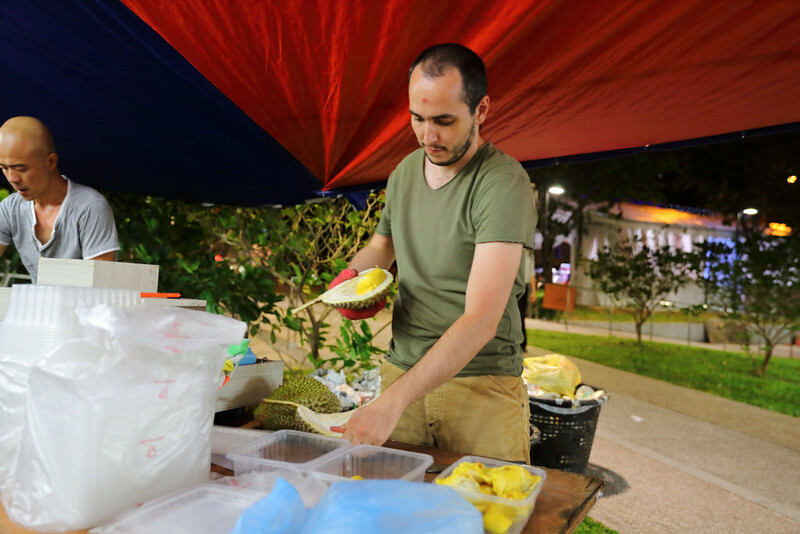 Given that durian sellers are typically middle-aged Chinese uncles or aunties, an ang moh peddling the fruit is something rare – almost mind-boggling, actually. But he believes that the growing acceptance is mainly due to Singaporeans liking to see expats making an effort to integrate into local culture – something he feels other expats don’t do enough of. Following the rise of durian shops opting to deliver their goods to Singaporeans craving for the fruit, Luke is also doing the same for his stall. He also noted that since durians aren’t allowed on public transport, given its pungent smell, “delivery solves that problem”. Typically, he uses Lalamove (“a fantastic company especially if I have last minute deliveries”) and a handful of trusty riders for deliveries. While business for him is brisk (on a good day, he receives up to 50 orders), he admits that this season is not as profitable as previous ones as supply is low. Durians are also more expensive now, even for sellers, due to large exports to China. He’s game to take on the challenge, however, and states that it’s “not an impossible obstacle” to still win the sales game. 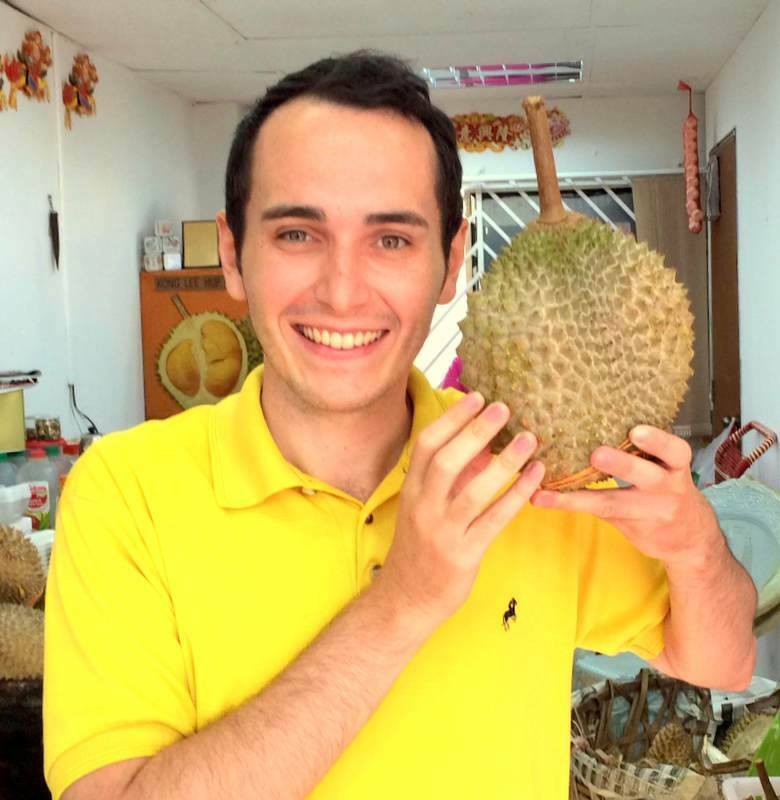 As the durian season ebbs away, does Luke still see himself continuing with the business in the long term?